Restrained optimism follows Minsk summit, new Russia sanctions off table? 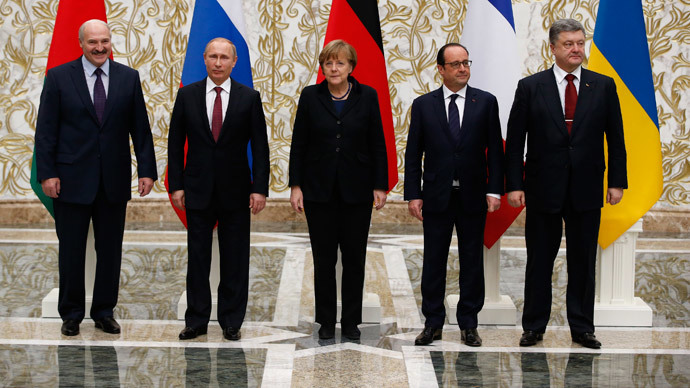 The ceasefire deal brokered by the so-called Normandy Four in Minsk has offered a “glimmer of hope” that the bloodshed in Ukraine can be halted and mend strained relations between Russia and the West. Reactions to the ceasefire deal in eastern Ukraine, which will come into effect at 12am local time on February 15, were measured but hopeful. German Chancellor Angela Merkel's spokesman Steffen Seibert reflected this sentiment on Twitter after the deal was struck. "After 17 hours, negotiations in Minsk have finished: ceasefire from Feb. 15 at zero hours, then withdrawal of heavy weapons. Therein lies hope," he tweeted. FM #Steinmeier: Negotiations on #Ukraine crisis in #Minsk have been a difficult process. We hope that both sides have negotiated seriously. Merkel also credited Putin for “putting pressure” on rebels in eastern Ukraine to agree to the ceasefire in a conflict which has claimed more than 5,400 lives in under a year’s time. German Foreign Minister Frank-Walter Steinmeier responded in a similar vein, saying that while the summit was not exactly a breakthrough, it should “steer everyone away from the path of escalation” in Ukraine’s eastern Donbass region. "The most important thing is that Moscow and Kiev agreed on a ceasefire... we strengthened the Minsk accords of last September," Steinmeier said in a statement. French President François Hollande was more upbeat, calling the deal a "comprehensive political solution" which would engender "serious hope, even if everything is not done." "All matters are addressed by this document," Hollande told journalists in regards to the agreement. “The agreement regarding Ukraine in Minsk shows that we are on the right path,” Hollande said. President of the European Council Donald Tusk also tweeted that Thursday’s agreement “gives hope” in the run-up to an informal meeting of the members of the European Council on Thursday. “Hope is important, essential, but not enough. Real test is respect of cease-fire on the ground Ukraine,” he wrote. He added that the situation in Ukraine and relations with Russia would be one of three major issues discussed at the meeting. Council of Europe Secretary-General Thorbjorn Jagland has voiced his positive impressions of the progress made in Minsk. He said in a statement that a concrete basis for implementing the ceasefire has been set up. He also expressed hope for the constitutional reform that is to follow, and that it would respect the sovereignty and territorial integrity of Ukraine. President of the European Parliament Martin Schulz has also joined the chorus of those welcoming the signing of the ceasefire agreement in Minsk, though with the caution which has typified reaction to the deal. 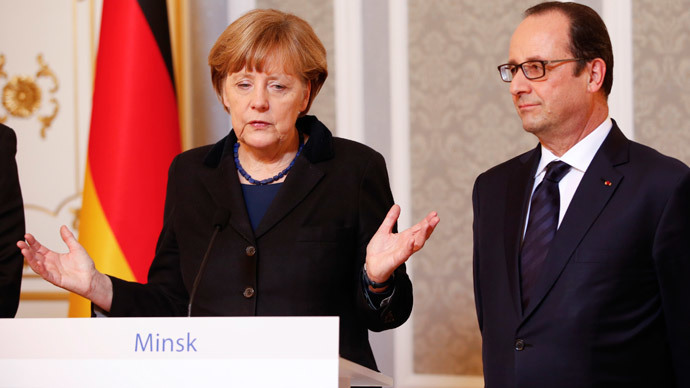 “Welcome Hollande-Merkel brokered ceasefire agreement in Minsk on Ukraine. All sides must now abide by agreement, turn words into actions,” he tweeted. Finnish Prime Minister Alexander Stubb, who was not a party to the negotiations, cautiously offered his praise for the deal. “The ceasefire is great news; however we should see how it will be implemented. People should no longer be killed; heavy weapons should be withdrawn,” he said. Speaking from Brussels, where an EU summit is set to be held on Thursday, Stubb offered hope that a thaw in relations with Moscow could be on the table. According to Stubb, if Merkel and Hollande are satisfied with the outcome of the Minsk talks, the EU will not discuss further sanctions against Russia. “If they say that the talks have failed, sanctions will ensue,” he added. Vice-President of the EU Commission Federica Mogherini also said new sanctions against Russia were unlikely to be discussed at Thursday’s meeting, which was postponed by several hours due to the Minsk talks. "I don't think today we will discuss sanctions," Mogherini told reporters. Rather, she said the talks would center on how “all possible EU means” can be activated to help sustain the ceasefire deal once it goes into effect. Lithuania President, Dalia Grybauskaite, however, said that the issue of actually changing the current EU sanctions regime against the Russian Federation would not be discussed until March. However, some representatives of the German business community consider the latest agreement to be a possible precursor for the lifting of sanctions on Russia. “The result achieved in Minsk could be a second step to opening the road to gradually lifting anti-Russian sanctions,” Eckhard Cordes, Chairman of the Committee on Eastern European Economic Relations, told DPA. A far more contentious issue on whether or not to send lethal defense arms to Kiev is also likely to be struck form the agenda in Brussels, Xavier Bettel, Prime Minister of Luxemburg, said. Speaking from the southeastern Ukrainian city of Dnepropetrovsk, he said that the outcome of the summit could have an impact on the current mandate and timeframe of the OSCE’s current monitoring mission in the country.